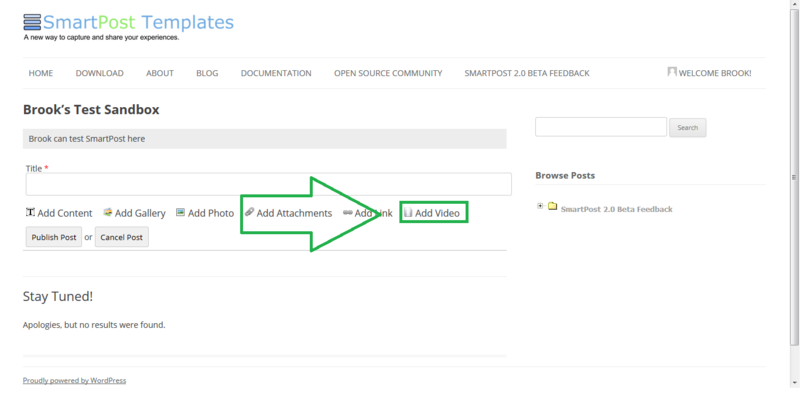 To add a video to your post, click on the “Add Video” button shown below. Once clicked, you should see the following. The two unique parts of this component are the description, and the video upload tool. To edit the description, simply click on it. To upload a video, drag and drop the file, or click on the “Browse” button to find your file. Once clicked, you should see something like the following. Select the viedo file you wish to use and hit “open”. Make sure the file is one of the allowed types, If it is not, you will receive an error message. Note: We currently support .mp4, .mov, and .avi video files. Once you’ve selected the video file, hit “Open” and you should see the following. You will be able to view the video once the post is published.